Canadian polar cruise specialist, One Ocean Expeditions, elevates the expedition cruise travel experience with an internationally acclaimed team of marine mammal experts conducting live scientific research on a voyage to the Antarctic Peninsula, 17-27 March 2017. One Ocean Expeditions' scientific team of cetacean experts includes world leading researcher, Dr. Ari S Friedlaender, Ph.D. Associate Professor, Fisheries & Wildlife Marine Mammal Institute at Oregon State University. Dr. Friedlaender will share cutting-edge scientific research results with passengers and encourage them to participate with an ongoing cetacean sighting programs during the voyage. The experts' guidance provides valuable and fascinating insight into the world of Antarctic science with an underlying message of conservation through education and inspiring experiences. "One of the most critical parts of our science is being able to better communicate our findings with the broader community. Our tag and drone work will be presented to guests and we will also show images of whales from above and how they behave. This unique perspective will allow both scientists and passengers to share the amazing lives of whales in Antarctica", states Dr. Friedlaender. Marine Mammals in Antarctica One Ocean Expeditions from One Ocean Expeditions on Vimeo. Sailing in the Southern Ocean during March provides the perfect opportunity to experience close encounters with minke, humpback and orca whales, as well as leopard, crabeater and Weddell seals. One Ocean Expeditions' impressive team also includes well known seal biologist, Charles Littnan, who leads the National Oceanic and Atmospheric Administration (NOAA) Hawaiian Monk Seal Research Program, the most proactive marine mammal research and recovery program in the world. Also on board is marine biologist Mike Double from the Australian Antarctic Division. As leader of the Australian Marine Mammal Centre, Double is in a position to influence the direction, shape and quantity of science that supports improved conservation outcomes for marine mammals, and to ensure government policy and management decisions are fully informed with science. In addition to the scientific research, One Ocean Expeditions' cruise will offer a wide diversity of excursions and activities on and off the vessel such as hiking and sea kayaking. Evening seminars and workshops led by expert marine biologists, geologists, historians and guest photographers also take place daily. Daily zodiac excursions will carry GoPro Underwater Viewing Apparatus and hydrophones to provide unparalleled live underwater viewing opportunities. 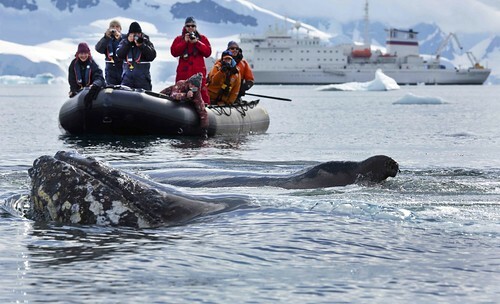 The 10-night Marine Mammals of Antarctica voyage departs from Ushuaia, 17 March 2017. Cost for triple share starts at US$6,595 per person (cruise only). All other cabin categories enjoy a US$1500pp credit on the cruise price – with prices from US$8595pp sharing a twin cabin (including credit). Travellers booking early for next season's 23 March 2018 departure will receive a US$750 early bird flight credit. Prices include local transfers, shipboard accommodation, all meals on board, daily excursions, activities, workshops and use of high-quality wet weather gear for the duration of the voyage.